The Call is a 2013 American psychological thriller crime film directed by Brad Anderson and written by Richard D'Ovidio. The film stars Abigail Breslin as Casey Welson, a teenage girl kidnapped by a serial killer and Halle Berry as Jordan Turner, a 9-1-1 operator, still suffering emotionally from a prior botched 9-1-1 call, who receives Casey's call. Morris Chestnut, Michael Eklund, Michael Imperioli, and David Otunga also star. The story was originally envisioned as a television series, but D'Ovidio later rewrote it as a feature film. Filming began in July 2012 and spanned a period of 25 days, with all scenes being shot in California, mainly Burbank and Santa Clarita. A screening of The Call was held at the Women's International Film Festival hosted at the Regal South Beach theater on February 26, 2013. TriStar Pictures released it to theatres on March 15, 2013. Considered to be high-concept by many reviewers, the film proved a commercial success, grossing over $68 million against budget of $13 million. Halle Berry was nominated for Choice Movie Actress in a Drama at the Teen Choice Awards and Best Actress at the BET Awards while the film itself received mixed reviews from critics, but praised Berry and Breslin's performances and the film's suspense. Los Angeles Police Department veteran 9-1-1 operator, Jordan Turner, receives a call one night, from a teenage girl, Leah Templeton, fearing for her life as a man breaks into her home. Jordan calmly advises her to conceal herself upstairs. When the call is disconnected, Jordan calls Leah back, a decision that costs Leah her life. The ringing phone gives her location away to the intruder. Jordan attempts to dissuade him from going further over the phone. He responds "It's already done" and hangs up, leaving her distraught. The next day, Jordan sees a television report confirming that Leah has been murdered. Emotionally affected by the incident, Jordan tells her boyfriend, Officer Paul Phillips, that she can no longer handle field calls. Six months later, she is working as a trainer for 9-1-1 operators. Teenager Casey Welson is kidnapped from a mall parking garage by a man named Michael Foster after shopping with her friend, Autumn, and forced into the trunk of his car. Casey had taken Autumn's disposable phone after she accidentally left it in the mall, and uses it to call 9-1-1. A rookie operator, Brooke, receives the call but is unable to handle it, prompting Jordan to take over. However, Casey's use of a disposable phone means that her location cannot be determined by GPS. While Michael drives, Jordan guides Casey through knocking out a tail light and signaling people in nearby cars. One woman who sees Casey waving her arm out of the trunk of the car calls 9-1-1, allowing the police to narrow their search. When Casey tells Jordan that there are cans of paint in the trunk, Jordan has Casey pour the paint out of the taillight hole. This attracts the attention of another motorist, Alan Denado, but Michael knocks him out with a shovel, and assuming him to be dead stuffs Alan in the trunk with Casey. Alan reawakens in the trunk and begins screaming uncontrollably, and Michael stabs him. Michael stops at a gas station where Casey gets an idea to crawl out of the trunk and scream for help. A gas attendant attempts to bust the door open, but Michael sprays him with gasoline and throws a lighter at him. Upon arriving at his destination, Michael removes Casey from the trunk and finds the phone in her pocket, with 9-1-1 listening on the line. Through the phone, Jordan informs him that his identity is uncovered and advises him to turn himself in and not hurt the girl. Before smashing the phone, Michael responds, "It's already done", leading Jordan to realize that Michael is the same culprit who killed Leah. Meanwhile, Paul, accompanied by Officer Jake Devans and others in law enforcement, raid Michael's home, but find only his wife and children. Finding a photo of Michael and his sister, Melinda, they realize that Casey resembles her. Additionally, the house seen in the photo is eventually revealed by Michael's wife to have burned down, although a nearby cottage still remains. The police raid it, but find nobody there and leave. Michael begins to wash and cut Casey's hair. Determined to rescue Casey, Jordan drives to the secondary home where she finds a number of photos of Michael with his leukemia-stricken sister. Stepping outside, she recognizes sounds from an outdoor flagpole -- the exact same sound she heard in the background in the final moments of the 9-1-1 call. She also finds a trap door amid dirt and scrub located where the primary house once stood. Jordan accidentally drops her cellphone down the cellar and climbs down in without calling the police. Navigating the cellar, Jordan hides from an emerging Michael. The cellar itself pieces together Michael's backstory. Michael had incestuous feelings towards his sister and was distraught when she fell ill, lost all of her hair and died of leukemia. Michael has a prop head that he keeps in the cellar that he treats like his sister. He has also been scalping and killing young girls who have similar blond hair, trying to find scalps that match his sister's hair. Jordan soon finds Casey strapped down to a dentist chair and attacks Michael, as he begins to lacerate Casey's scalp. She frees Casey and both make an attempt to escape the cellar, during which Casey stabs Michael in the back with a pair of scissors. Michael pursues them and they are able to injure and kick him back down into the cellar, rendering him unconscious. While he is knocked out, they tie him to a chair. When he regains consciousness, they inform him that they plan to leave him to die and claim that Casey had escaped, that she was found by Jordan in the woods, and that Michael disappeared. Pleading with them that they cannot just leave him there, Jordan replies to Foster using his own words, "It's already done." Michael shouts insults at them, Jordan locks the door and leaves, avenging Leah's death. "I thought, 'That's a world we've never seen before in a film.' You never get to see the other side of it. [They were playing some actual calls on the news segment, and] listening to the calls, I got a chill up my spine as I envisioned what was going on [on the other end of the phone], and I thought that it would be a great world to play into." Screenwriter Richard D'Ovidio was inspired to script the story after his wife heard an NPR segment with a 9-1-1 operator discussing her job. He began to research the subject and visited the Los Angeles Metropolitan Communications Dispatch Center (MCDC). Finding the center, which has backup generators, bulletproof windows, and a moat surrounding the building, to be "pretty amazing," he decided to shed light on what he viewed as a previously overlooked occupation. The story was originally conceptualized as a television series titled The Hive (a reference to the constant calls and conversations sounding like bees buzzing), but D'Ovidio decided to redraft it as a film on realizing that "the operators couldn't be the ones kicking in doors and going out into the field" all the time. As a result, what was planned to be the pilot episode was expanded and revised as a movie. For most of the film, Berry's character, Turner, the 9-1-1 operator, does stay inside "the hive" before becoming actively involved in the search for Breslin's character, Welson, the kidnapped caller. D'Ovidio chose two female leads, explaining, "I wanted strong women... I think it was appropriate here, since most 911 call operators are women." Berry remarked, "I love the idea of being a part of a movie that was so empowering for women. We don't often get to play roles like this, where ordinary people become heroic and do something extraordinary." D'Ovidio chose to tell the story from the perspective of two characters—the operator and the caller—believing that it would become repetitive if it focused on only one. As a result, he switched perspectives every ten pages when writing the screenplay. As well as collaborating on the story with his wife, Nicole and Jon Bokenkamp, he accepted suggestions from Berry, Breslin and Eklund: "Halle came in with some great notes and Abigail and Michael and it started to flesh things out. I'm not one to say 'no' to a great suggested line of dialogue. It just makes me look better as a writer! I feel it's a very collaborative process, and some of the happiest accidents happen when you just listen to people. When someone comes up to you and says, 'Why don't we do it this way?' I think that it's important to listen." Chestnut, who plays Phillips, a police officer and Turner's boyfriend, prepared by riding along with Los Angeles police officers to observe what it is like to be an officer in a squad car and Berry prepared for the role by visiting a call center and observing the operators at work. She told a Miami Herald interviewer, "You get a different perspective by doing research... You can't know what it's like to be a cop even though you've seen it in the movies. But nobody ever saw a 9-1-1 center. I thought they lived in the ground somewhere! It was interesting to see who they were and how they deal and how stressful it can be. I was a wreck watching them. They would just be as cool as can be doing their thing. I thought, 'I could never do this job.'" Producers scheduled for The Call to be filmed in Canada in June 2011 after they failed to make the cut for a California tax credit. With a low budget of $13 million, they settled on Ottawa, Ontario, where director Anderson had just finished another project. However, the California Film Commission (CFC) called back nine months later and informed them that the waiting list had been largely cleared and that they now qualified for $1.9 million in tax deduction. According to Producer Michael Helfant, they were "literally days from starting to put down a deposit." Berry was reportedly pleased with the news, having wanted to stay in Los Angeles and the CFC helped secure film locations for the project. With a crew of roughly 120 persons, filming took a total of 25 days, spanning from July to August 2012. Car chase scenes were shot at Long Beach and a Westlake Village office building was modeled as the emergency dispatch center. The latter was also used for the scenes in which Welson is locked in the trunk of a car. Other filming locations include the Burbank Town Center on Magnolia Boulevard in Burbank, California, Santa Clarita, California and the 170 Highway. At one point, Berry was rushed to Cedars-Sinai Medical Center after falling headfirst on concrete while shooting a fight sequence. A spokesperson for Berry confirmed that she suffered a minor head injury and was taken to the hospital as a precaution, but she checked out healthy and was released. Berry told interviewer Kimberly Grant, "The hard part for me was to try to stay connected to Phillips and Welson." This was because, Grant writes, "she had to spend an entire day reading 21 pages of dialogue, rattling off in quick succession 911-operator jargon, that would be cut and edited to fit the film... In film terms, that means Berry performed for 21 minutes straight with no breaks, not an easy feat for any actor." Though she enjoyed working with Chestnut, Berry told Grant that it was difficult being unable to see her co-stars for most of the film: "That was my constant challenge; to stay on such an emotional level [as Jordan], so that I would be on the same level as they [i.e., Casey and Officer Phillips] were. I used that feeling of frustration and of being stuck to fuel my character." The score of the film is composed by John Debney. Unlike the other films he composed with an orchestra, the film's score is completely filled with dark and intense electronic and synthesized elements. Although, he used little orchestral elements in the score. Sony Pictures Worldwide Acquisitions paid very few money to acquire U.S. distribution rights. But the film screened for a test audience in November 2012 and scores were even higher than anticipated, prompting Sony to give the film a wide theatrical release. Spanning 94 minutes upon completion, the movie received an R rating for violence, disturbing content and some language. Berry and Chestnut promoted the film at the ShowPlace ICON movie theater at the red-carpet premiere in Chicago on February 28. Berry also traveled to Rio to promote The Call in anticipation of its April 12 release in Brazil. The Women's International Film Festival hosted a screening of The Call at the Regal South Beach theater on February 26, 2013. Chestnut told the audience that he would sign on for a sequel, saying about Berry, "I didn't get to kiss this woman enough!" Berry added, "I'm in the movie and even I was scared." The film was released in theatres on March 15 and on DVD and Blu-ray Disc on June 25 of that same year. DVD extras included a featurette entitled "Emergency Procedure: Making the Film" and commentary from Abigail Breslin, Halle Berry, and other filmmakers. The Blu-ray version came with more features, including deleted scenes, an alternate ending, Michael Eklund's audition tape, featurettes entitled "A Set Tour of The Hive and The Lair" and "Inside the Stunts", as well as all of the original DVD content. According to Boxoffice, The Call was expected to earn about $11–12 million on its opening weekend in 2,507 theaters across the United States but surpassed this by a significant margin and grossed $17 million in its first three days. This indicated good profits, as the film cost about $13 million to produce and Sony paid a much smaller amount to acquire U.S. distribution rights. With box office takings of over $68 million, The Call is WWE Studios' most commercially successful film to date, the previous top-grossing productions being See No Evil, which stars professional wrestler Kane (Glenn Jacobs) ($19 million) and 12 Rounds, which stars professional wrestler John Cena ($17 million). Critics were surprised by the movie's box office success because "Berry hadn't had a hit in a number of years" and because the R rating narrowed down the audience. WWE Studios head Michael Luisi commented that The Call "[exceeded] our most optimistic forecasts." Despite mixed ratings, Berry and Breslin’s performances were praised by critics and viewers alike. On review aggregator Rotten Tomatoes, the film has an approval rating of 45% based on 130 reviews, with an average rating of 5.2/10. The site's critical consensus reads, "The Call builds plenty of suspense before taking a problematic turn in the third act." On Metacritic, another film review aggregator, the film has a weighted average score of 51 out of 100, based on 23 critics, indicating "mixed or average reviews". Audiences polled by CinemaScore gave the film an average grade of "B+" on an A+ to F scale. Entertainment Weekly gave the film a B rating, saying that the tale "is surprisingly good and surprisingly gruesome fun. Eklund makes the most of the maniac role and Breslin is a sympathetic victim." Reviewer Dwight Brown wrote, "The script gives Berry a blue-collar character she can make accessible, vulnerable and gutsy... Chestnut is not suitably gallant and stalwart as her caring lover and a cop on a mission... This film is a whole lot scarier than you think it's going to be." Manohla Dargis of The New York Times wrote, "An effectively creepy thriller about a 911 operator and a young miss in peril, The Call is a model of low-budget filmmaking." She praised its "clean, clever premise" and said that Berry's Jordan is "an old-fashioned hero in many respects, so it's fitting that Mr. Anderson uses old-fashioned filmmaking techniques, like crosscutting, to build tension and old-school exploitation tricks like evil to justify taking the story dark and then dark and bonkers." A reviewer for The Hutchinson News, Jake Coyle, commented, "Director Brad Anderson... working from the simple, high-concept screenplay by Richard D'Ovidio, ably cuts between Berry's increasingly emotionally-attached Jordan Turner and Breslin's panicking Casey Welson, contrasting the fraught strategizing of Turner with the frantic police pursuit of the kidnapper." Coyle stated that "The Call dials up a shallow thrill ride, but one efficiently peppered with your typical 'don't go in there!' moments," but concluded, "The Call is a rudimentary, almost old-fashioned 90-minute escape that manages to achieve its low ambitions." Rating the film 2 stars out of 4, Coyle writes that once the film "manages to build some suspense from the trunk of the car-- the clever attempts to elicit help, the dwindling cell phone battery-- its deficiencies become less forgivable once the action turns off the road." Roger Moore of The Seattle Times showed mixed feelings in his review: "Rare is the thriller that goes as completely and utterly wrong as The Call does at almost precisely the one-hour mark. Which is a crying shame, because for an hour this is a riveting, by-the-book kidnapping." Moore explained what he saw as the highs and lows: "Brad Anderson turns this...serial-killer hunt...into a real edge-of-your-seat thriller. Given...a half-decent tale of horror, guilt, problem-solving and redemption, Anderson couldn't go far wrong," but, Moore states, "It's only when our Oscar-winning heroine puts down the phone and sets out to do some sleuthing of her own that The Call disconnects, turning into something far more generic and far less exciting." The Los Angeles Times turned in a similar review: "The semi-fresh thriller, set mainly in an emergency call center and on the freeways of Los Angeles, puts a tech slant on a damsel-in-distress setup. It buzzes along for a while, the promising plot innovations inviting suspension of disbelief, before by-the-numbers implausibility, over-the-top valor and unsavory contrivances take over and the line goes dead." Berry was nominated for two awards for her role as Turner in The Call in 2013. She was nominated for Best Actress for the BET Awards, which were created by the Black Entertainment Television network to celebrate African Americans and other minorities in music, acting, sports and other fields of entertainment over the past year, Berry lost to Kerry Washington for the role in Django Unchained. She was also nominated for Choice Movie Actress in a Drama at the Teen Choice Awards, but lost to Emma Watson for The Perks of Being a Wallflower. The film was also nominated for Best Thriller Film at the 40th Saturn Awards and Berry was nominated for Saturn Award for Best Actress, but lost to World War Z and Sandra Bullock, respectively. ^ "THE CALL (15)". British Board of Film Classification. June 7, 2013. Archived from the original on June 24, 2013. Retrieved June 12, 2013. ^ a b "The Call (2013)". Box Office Mojo. Retrieved December 7, 2013. ^ a b c d e Decker, Sean (January 14, 2013). "The Call Set Visit Report - Part One: Writer Richard D'Ovidio on His Inspiration, Research, and More!". Dread Central. Retrieved March 17, 2013. ^ a b Brown, Dwight (March 15, 2013). "The Call". The Huffington Post. Retrieved March 17, 2013. Jordan (Berry) works in the L.A. 911 call center. They call it the hive, because with the constant din of conversations it sounds like bees at work. ^ a b c Grant, Kimberly (March 13, 2013). "Berry, Chestnut Expound on The Call Roles - and more". South Florida Times. Fort Lauderdale. Retrieved March 17, 2013. ^ Marr, Madeleine (March 10, 2013). "Call 911! It's Halle Berry and Morris Chestnut". The Miami Herald. Miami: The McClatchy Company. Retrieved March 17, 2013. ^ a b Verrier, Richard (March 20, 2013). "A Fateful Call Keeps Filming of 'The Call' in L.A." Los Angeles Times. Retrieved August 17, 2013. ^ Bull, Sarah (July 18, 2012). "Pictured: Halle Berry rushed to hospital 'after accident on movie set'". Daily Mail. London. Retrieved January 23, 2013. ^ a b Zwecker, Bill (March 12, 2013). "Halle Berry says 'I was the lucky one' in Morris Chestnut love scenes". Chicago Sun-Times. Chicago: Sun-Times Media Group. Retrieved March 17, 2013. ^ Smith, Grady (March 16, 2013). "Box office update: Oz wins Friday with $11.4 million; The Call crushes Burt Wonderstone". Entertainment Weekly. New York: Time Inc.
^ a b Dargis, Manohla (March 14, 2013). "Life-Altering Plea for Help". The New York Times. Retrieved March 18, 2013. ^ Natasha (March 1, 2013). "GETTING AN EYEFUL: Morris Chestnut & Halle Berry Roll To Chicago To Promote The Call". Theybf.com. Retrieved March 17, 2013. ^ "Halle Berry Announces Brazilian Visit to Promote 'The Call'". Boxoffice. March 28, 2013. Retrieved August 17, 2013. ^ Caballero, Gustavo (February 26, 2013). "Events / 'The Call' Red Carpet Screening". Ocean Drive. Miami Beach, FL. Retrieved March 17, 2013. ^ Marr, Madeleine (February 28, 2013). "Will Matt Damon renew vows in Miami?". The Miami Herald. Miami: The McClatchy Company. Retrieved March 17, 2013. ^ "The Call". Blu-ray. June 25, 2013. Retrieved August 17, 2013. ^ Rawden, Jessica (May 7, 2013). "The Call Will Hit Blu-ray And DVD In June". Cinema Blend. Retrieved August 30, 2013. ^ Greaser, Marc (April 7, 2013). "'The Call' Dials Up WWE's Film Biz". Variety. Retrieved June 17, 2013. ^ a b Goodwin, Liam (April 7, 2013). "The Call 2 – Sequel Plans". Filmonic. Retrieved August 18, 2013. ^ "The Call (2013)". Rotten Tomatoes. 2013. Retrieved June 12, 2013. ^ "The Call reviews". Metacritic. Retrieved August 30, 2013. ^ "The Call". Entertainment Weekly. New York: Time Inc. March 15, 2013. ^ Coyle, Jake (March 14, 2013). "Review: The Call dials up a shallow thriller". The Hutchinson News. Hutchinson, Kansas: Harris Enterprises. Retrieved March 17, 2013. ^ Moore, Roger (March 15, 2013). "After a riveting hour, hang up". The Seattle Times. Seattle: Seattle Times Company. Retrieved March 17, 2013. ^ Linden, Sheri (March 14, 2013). "Review: Halle Berry is fierce in 'The Call,' but script needs 911". Los Angeles Times. Retrieved March 18, 2013. 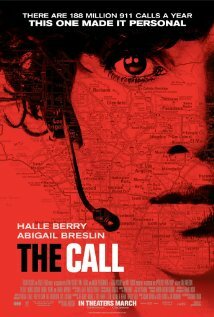 ^ "Halle Berry nominated for BET Award for "The Call"". World Wrestling Entertainment, Inc. June 11, 2013. Retrieved July 19, 2013. ^ "Halle Berry: Teen Choice Awards Nominee for 'The Call'!". Just Jared. May 23, 2012. Archived from the original on February 3, 2014. Retrieved July 19, 2013. This page was last edited on 7 February 2019, at 20:51 (UTC).